Ever since the first forecast of race day was posted, I was certain I was going to learn first-hand how running 26.2 miles in Seattle on December 1st could be a truly epic, if not downright miserable, experience. Indeed, even the forecast one day prior pointed to a twin event that lead me to melodramatically use the adjective “biblical” in more than one conversation: a large flow of moisture from the Pacific breaking the previous week’s high pressure system, and a sudden blast of cold air sinking down from the Yukon likely changing the rain to snow on at sea level by nightfall after the race. I awoke at 4 am to have my pre-race coffee, bagel and banana. 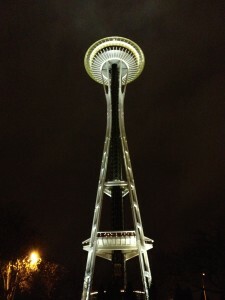 After consuming just those few morning carb calories, I stepped outside to assess the weather first-hand and ended up walking toward the start by the Space Needle- likely way too much time on my feet prior to a marathon, but hey, pre-race jitters. 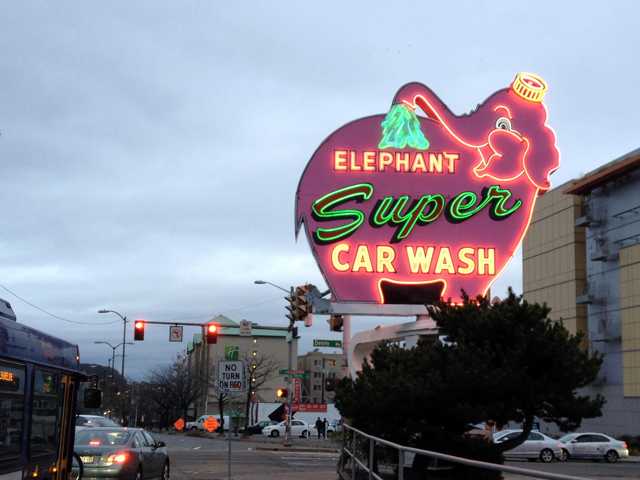 Despite some wind gusts and clear evidence of moisture on the streets there was… no rain. 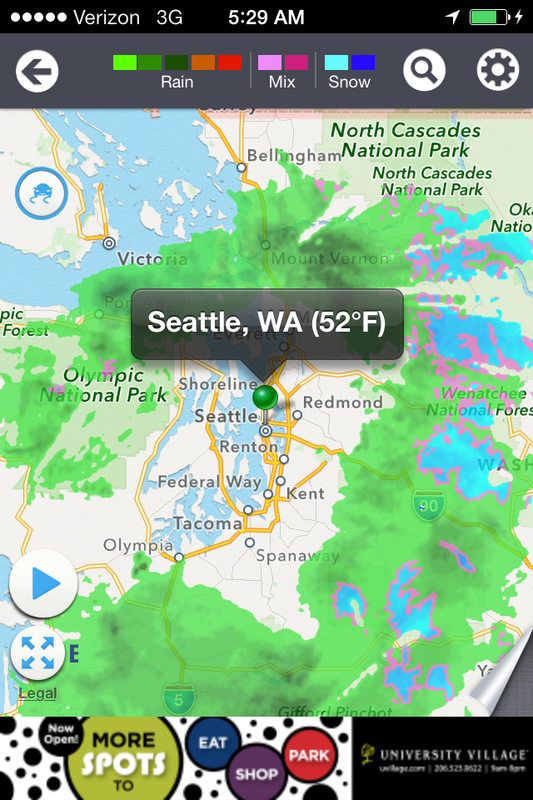 Based on the map on my phone, it looked like while rain and snow had clearly arrived to Western Washington, the Puget Sound was, for now, in the rain shadow of the Olympics. For the rest of the pre-race and then out on the run, I was positive the party was going to end at any moment and I was going to be soaked slogging through puddles. Assuming all week I would be running in mid 40s temps and rain, I had planned on shorts, my Conservation Lands Foundation Patagonia shirt (thanks for sponsoring #Run4ConservationLands!) my favorite merino wool t-shirt (also Patagucci) as a base layer under that, my Smart Wool arm warmers, gloves and a light beanie. But with temps already in the low 50’s I changed the plan- ditched the merino wool, put on the Brooks Nightlife hat (still thinking the downpour was imminent- love the big brim on that thing) and some lighter arm warmers. I also slathered some Aquaphor over skin I thought might chafe, including a solid coat on my feet (thanks for the tip Laura, although I’m glad I didn’t try the plastic bag technique). 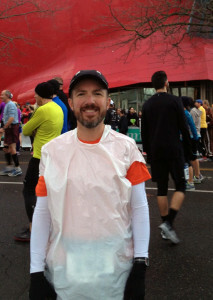 Caffeinated gel at 8 am, garbage bags off (yes, I had two keeping me warm- why suffer until you’re actually running? ), gun right at 8:15, and we were off. 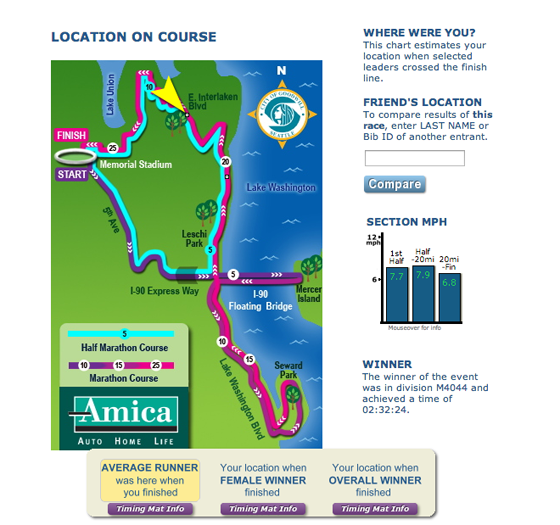 You can reference Seattle Marathon course information at this post. 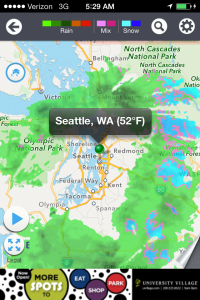 The only downpour I would see in Seattle? Of the tips I received the night before about the course, the first one, “watch out for the monorail pylons,” came in handy right off the bat. Actually, avoiding getting boxed into having to side step the massive concrete posts wasn’t really much of an issue, perhaps because I had chosen to start off near the 3:25:00 pacer. Congestion in the early miles was probably much more of an issue further back. With my first splash of Gatorade at the mile 2 water table downed, the field stretched out noticeably and I let the 3:25:00 pacer sign float off in front of me as we entered the closed off I-90 express lanes. With the walkers in the lane to the left of us, I took my first looks around at the scenery- downtown visible below the low-hanging clouds, with a few peeks of blue sky here and there. Before mile 4, the course enters the expressway tunnel, pleasantly sheltered from the wind, but felt slightly ominous with runners knowing full well the out and back to Mercer Island on the I-90 floating bridge came next. First chip timing mat crossed at mile 4.5: 0:34:13, 7:37 pace. This was definitely ahead of pace for a 3:30:00 finish, but not that much ahead of the pace calculation I did allowing for the hills on calculation I did at Taz Running. Emerging from the tunnel, with marathoners staying to the left to get onto the bridge and the halfers exiting to the right, the white caps on Lake Washington were the first things I noticed. Next I noticed the wind- strong, steady, but thankfully at my back and to the right as we headed due east. Passing the mile 5 maker (all the markers save maybe two were clearly visible and affixed to potties, some complete with a volunteer calling out split times) the lead runners returning from Mercer Island came into view. The two out and back legs were actually highlights of the course for me- pretty thrilling to see the elites jamming out speedy times. It was also obvious they were working together facing the stiff headwind- bunched up like bike racers. Coming off the bridge and climbing the brief hill to the Mercer Island turn around, I ate my first gel (I gelled at 6, 12, 18 and 24 miles, GU and Clif Shot mixed), and flipped my hat backwards preparing for the headwind. Running into the tunnel, I grabbed another Gatorade (I made sure to get a cup for a few sips at each of the tables), made the 180 turn around the cone and headed back for the bridge. Decision time. Perhaps unintentionally already destroying my chance at a negative split, the 3:25:00 pace group was still visible in front of me even after 6 miles. In fact they were only about 50-70 yards ahead of me. With just a few racers scattered around me also battling the head wind as we descended the hill, I contemplated how disastrous a mistake it would be to bridge up to the group in order to get out of the wind. One more strong gust, and I went for it- pushing my heart rate from 160 bpm to 170 to motor up into the pack. There I found two others who had also made the choice. We shared congratulatory chuckles about how great it was drafting, and I settled into a pace I knew I shouldn’t have been pushing for the mile and half return to the peninsula. Did this choice ultimately hurt me? I did think about it in the later miles as I nervously ticked down the minutes to my 3:30:00 goal, but for now, it was glorious running in a pack of 20+ into a head wind surrounded by Lake Washington’s white caps. 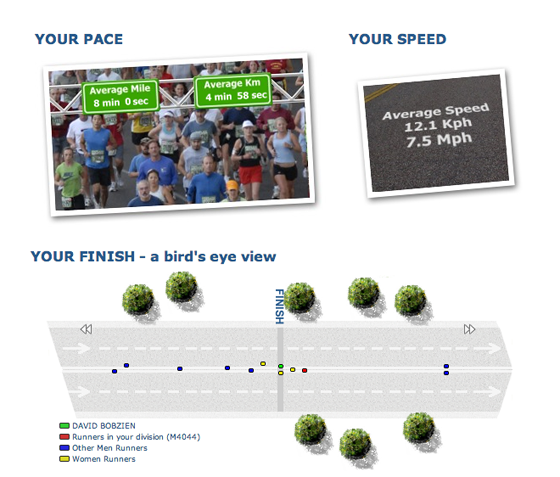 Second pre-race course tip implemented. 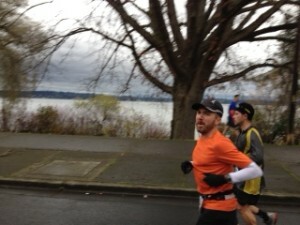 The course change from the bridge to Lake Washington Boulevard is abrupt. A sharp turn to the left, down a steep paved trail from the bridge, which I felt like I was sprinting down as I passed a few runners who were putting on the breaks, and we were heading south to Seward Park. Did I see the second timing chip mat at this transition? Perhaps I missed stepping over it as I judiciously cut course tangents. Was there one? Result: “Missing data” for mile 8.1. This section of the course is exceedingly pleasant- especially this day as we ran all the way to mile 20 on the leeward side of the peninsula. Pleasant neighborhoods, a wide-open, mostly flat road, the sound of waves lapping onto the short, and the regular grouping of spectators encouraging runners on. But then I encountered the Ginger Bread Man. The requisite “oh my gosh I can’t be beat by the Ginger Bread Man” thought crossed my mind (although it was clear he was already struggling), but more annoying were the litany of bad jokes from spectators that would greet us for the two mile stretch we were close to each other (“Run, run as fast you can! It’s the Ginger Bread Man!”) Of course the little ones along the course LOVED seeing the guy, and since the runner was planting seeds of life-long running appreciation… even more kudos to him. At 11.5 miles, the course passes a medical aid station, bends left (there were a bunch of spectators here) and heads into Seward Park. This circumnambulation of the small forested peninsula may well have been one of my favorite parts of the course. It was very quiet, and I really felt settled into my running here- a great place to cross the 13.1 mile chip mat: 1:42:41, 7:50 per mile. Definitely still ahead of pace (but I felt great! ), and thankfully far ahead of the Ginger Bread man by this point. Leaving Seward Park, and heading north along Lake Washington on Lakeside Avenue, I felt a combination of relief, since I was now past the halfway point, and dread- knowing the final, toughest miles lay ahead. Doubling back along the course offered the second view of the slower runners, and as I passed the struggling masses, all I could think of was, “my gosh, some of these people are going to be on their feet doing this a lot longer than me.” As if to waken me out of my now-solidified pace groove stupor, a voice ahead calmly called to me as he approached from the opposite direction: “Nice job 193.” Oh hey, that guy’s talking to me! I carried this gesture of equanimity all the way through the tougher parts of the course at the end. While I thought I had properly set my internal metronome to not overheat my pace, between the shelter from the wind (I even considered taking off me arm warmers at one point) and the relative flatness of these miles, I ended up crossing the 20 mile chip mat with a fast split: 2:34:33, 7:44 pace. This was far ahead of the 2:40:11 figure I could now barely make out on my arm, sweat and the arm warmer having taken their toll. I tried not to feel too cocky about this “time in the bank,” because I knew (sort of) what came next. Even though there was still no rain- it felt imminent and I was convinced I was going to spend at least the closing hour in a down pour. 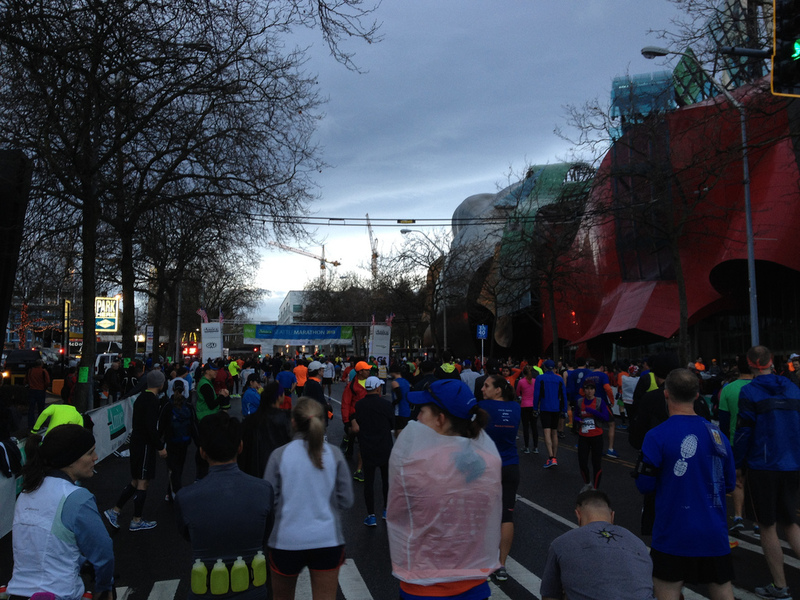 After miles of sheltered, flat running, the course takes a left up Galer Street, serving up a famously short (two block) steep hill that definitely is a wake up call that the final 10k of the Seattle Marathon is not a cake walk. After cresting the hill, the course turns left again to climb Madison Street. The spectators and their encouragement on this mile of the course are especially welcome- and of course, they themselves have the fun of watching some seriously suffering runners trudging up these hills. Keeping an eye on my HRM so that I didn’t redline, I just ground it out. While the hills in this stretch were tough, the sudden exposure to wind (but still no rain!) made things seem that much tougher. Following a quick downhill, the course then turns right into the arboretum where the climbing continues. I’d have to think that if these were miles 1-3, instead of 21-23, they’d be the most picturesque part of the run (tree-lined twisty roads, occasional skyline views of surrounding neighborhoods) but of course late race fatigue saps one’s ability to appreciate scenery. It was here the carnage became noticeable- I passed numerous runners in this stretch on the side of the course nursing cramps, walking, etc. 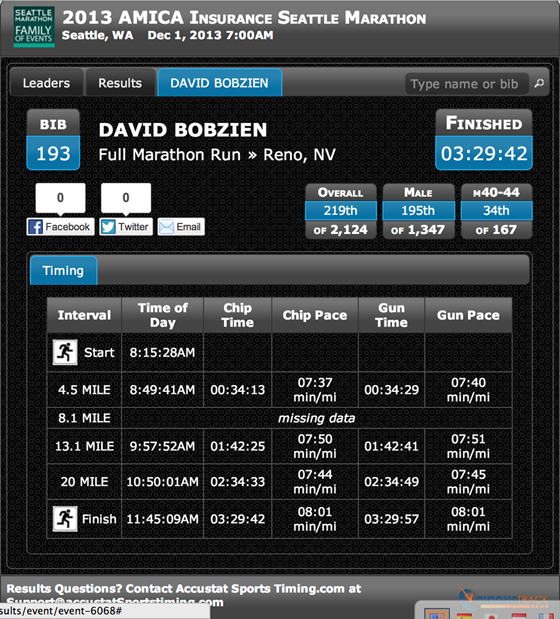 The chip data report (below) revealed I passed 68 runners in the past six miles while only four passed me. I noted the mile 23 marker in my mind as the furthest I had run in training, and was thankful for all the long runs I had done with fast finishes, some uphill, during the last two months. Emerging at the top of the climbs, the course makes a first cross over I-5, and turns left on Boylston to follow the interstate- I couldn’t decide if the two-story tall sound wall was a windbreak or a wind tunnel (looking at my watch data, more likely it was the latter.) At this point, I could smell the finish line, but some panic began to set in as to where I was in relation to my 3:30:00 time goal and whether I had anything left in the tank. I ate my last gel, a GU with caffeine (which seemed to help right at the end.) I checked my arm scribbles one more time to see what time I needed to hit at the 25 mile mark: 3:20:22. After a turn under I-5, another climb to a pass once more over I-5 I could then see the 25 mile marker. 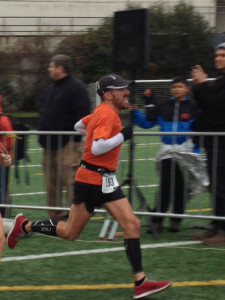 Sensing the minutes I had banked along Lake Washington had slipped away of the last five hilly and chilly miles, I knew I had to take a chance and charge the finish. 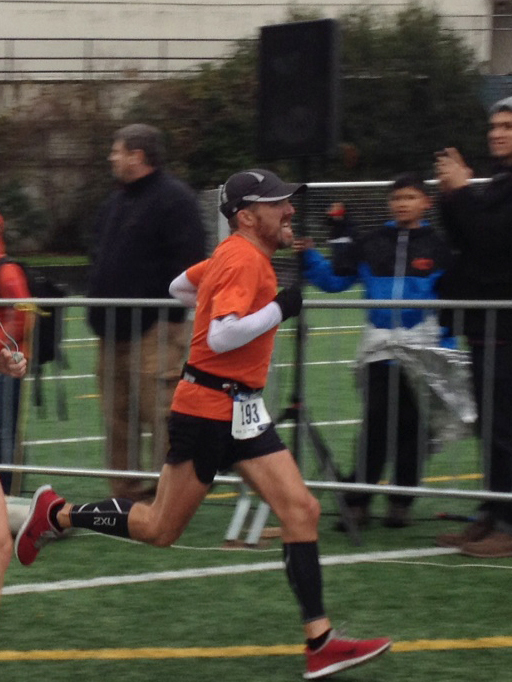 Upping my speed as a I headed downhill to the marker (3:20:37- 15 seconds down!) I envisioned myself bombing down single track on the Tahoe Rim Trail as I negotiated around other runners and over metal grates and broken asphalt, knowing that a misstep in these closing minutes could be… well… really bad. One more climb up Mercer Street and I was at the redline. I felt a pang of a cramp in my right calf, likely due to the fast downhills I had just run, and knew it was all going to come down to these last two minutes. As I turned and saw the stadium, one last glance at my watch showed that I had about 50 seconds to cross the line at the far end of the football field inside. Sprinting to the line, another runner overtook me right before the finish. 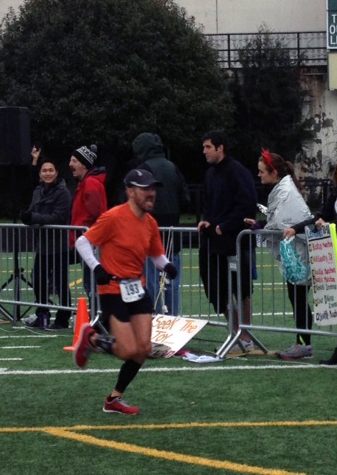 I crossed the line… stopped my watch, accepted a medal, grabbed a water and a space blanket, and I was done. While the “I’m never doing this again thought” never entered my mind, my legs felt utterly seized, and I was pretty audible in whimpering my leg’s complaints (a few stares my way perhaps.) In the end, I was walking around the city by the end of the day with only a blood blister on each heel. Oh, and still… no rain. Final chip time: 3:29:42, 8:01/M. Goal beat by a mere 18 seconds. 7 5:57 163 168 Missed pushing my watch button at the previous mile marker. 8 8:01 160 168 I-90 bridge return. 15 5:55 159 163 Missed pushing my watch button at the previous mile marker. 21 9:15 167 170 Galer, Madison Street climbs. 23 8:53 163 168 Interlaken climb. 24 9:33 167 174 Wheels start to come off. 25 6:57 169 210 Time to jam. 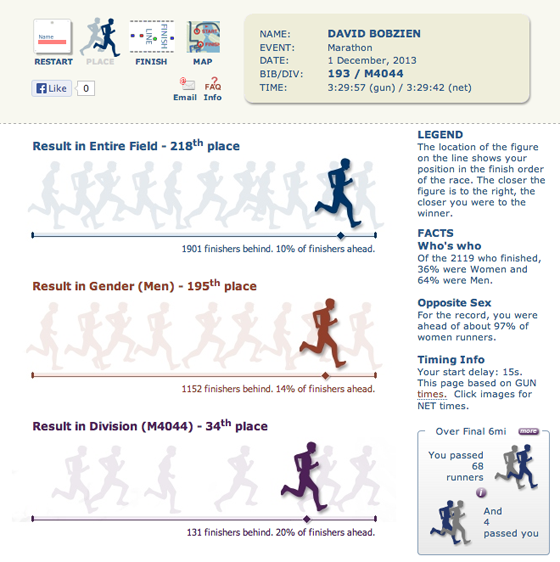 26.2 9:24 186 211 Stopped my watch a few seconds after crossing line.